Suzuki ATV Guide - Videos, pictures, reviews, specs, and more. Since the first four wheeler Suzuki ATV was introduced in 1983, there have been a lot of "firsts" for the guys that started the whole quad class. So many that I imagine the other manufacturers keep a close eye on what Suzuki is bringing out next! The 1985 Quad Racer was the first sport quad - another new ATV class. Followed by the Quad Racer 500 - the first big bore sport quad. 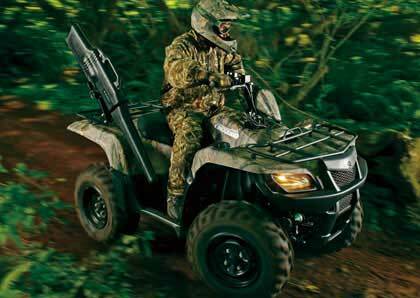 The 2002 Quad Sport Z400 - brought high performance 4-stroke engines to sport ATVs. The 2005 King Quad 700 - introduced big bore engines and fuel injection to the utility class - turning it into "sport" utility! The 2006 Quad Racer R450 - a fuel injected factory racer for the masses. Probably started more ATV racing careers than any other quad. The goal of this ATV Guide is to bring you the information you want while watching what Suzuki is up to. It just might be inventing another ATV class! Suzuki 450 ATV - King Quad - Is it a "best buy"? The King Quad seems to get rave reviews from most owners, so let's take a look at this popular Suzuki four wheeler. We rate this ATV as one of the best values available, and with dealer discount specials on past year models, it deserves a serious look as a Best Buy. Suzuki Parts Warehouse - See how to find thousands of parts in a virtual parts warehouse with tips on finding great ATV parts deals. Suzuki Used ATV Parts - Online auctions have over 7,500 Suzuki parts listed every day. This guide will show you how to find the best values and avoid rip-offs.